Scale-up Testing units are especially designed to provide excellent scalability from the lab- to the pilot or production scale. They are designed to operate with the lowest amount of feedstock possible but still provide highly-scalable data to full-scale units. These pilot unit represent the largest scale units that ILS supplies. ILS was chosen for this project because of our vast experience in fixed-bed reactor design and our willingness to design both the hardware and process-control system for this company to their local site standards. The client has a large bio-refinery and needed to have a pilot unit that operated at as small a scale as possible but still large enough to allow for continuous atmospheric and vacuum product fractination to allow for a full-product workup and analysis. This data could then be implemented in complex ASPEN simulations to predict the impact that different catalysts will have on the refinery production. The unit had to be very flexible and be able to handle used-vegetable oil type feedstocks of different qualities. The unit can operate with up to VGO-type, high-viscosity feedstocks. The 2m long reactors can be operated either isothermally or adiabatically making them particularly powerful tools for process optimization studies. The ability to operate the reactors in up- or down flow mode means that 100% effective catalyst wetting can always be realized. The unit is capable of operating the two fixed-bed reactors either in parallel or in series, when hydrotreating followed by hydrocracking is desired. 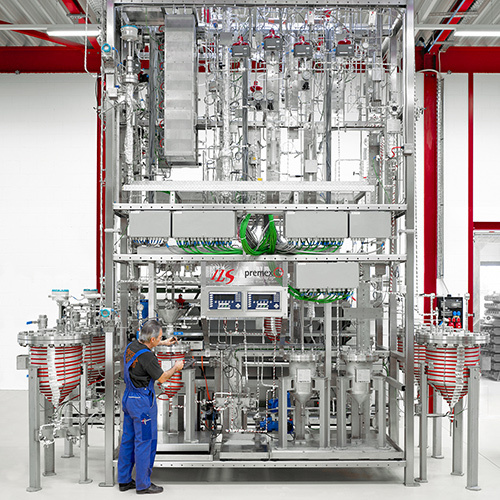 The fully-integrated atmospheric and vacuum distillation columns mean that products formed can immediately be fractionated into sufficient quantities to make complete characterization of the fuels formed possible. ILS managed to split the unit into explosion proof zones to maximize the safety of operating with the unit. The unit was delivered to the clients 100% satisfaction and has been in operation for almost 10 years now. It is a powerful tool that provides the clients process simulation group and catalyst group with the data they need to choose the best catalyst provider and accurately predict the effect that the choice of a particular catalyst and set of operating conditions will have on the full-scale process. One of ILS oldest clients came with a request for a pilot-scale high-impact polystyrene pilot plant. The group had very little in-house experience in this area but had had extensive experience working with ILS in a number of other areas. The ever-increasing world demand for HP-polystyrene is a major driver for further development in this area. ILS had to overcome numerous technical challenges with this project. The unit had a very limited budget. ILS came up with a design that met the clients needs and still fit their budget. The highly-explosive styrene and ethylbenzene feedstocks had to be stored in a separate building in an explosion-proof certified operating space. ILS designed the feedstock storage and dosing modules to be fully explosion proof adhering fully to our clients stringent specs. The reaction section had to operate with highly-viscous polymer. This required powerful stirring and ILS went one step further and incorporated torque sensors, which proved extremely valuable to the client as an on-line tool for judging product quality. 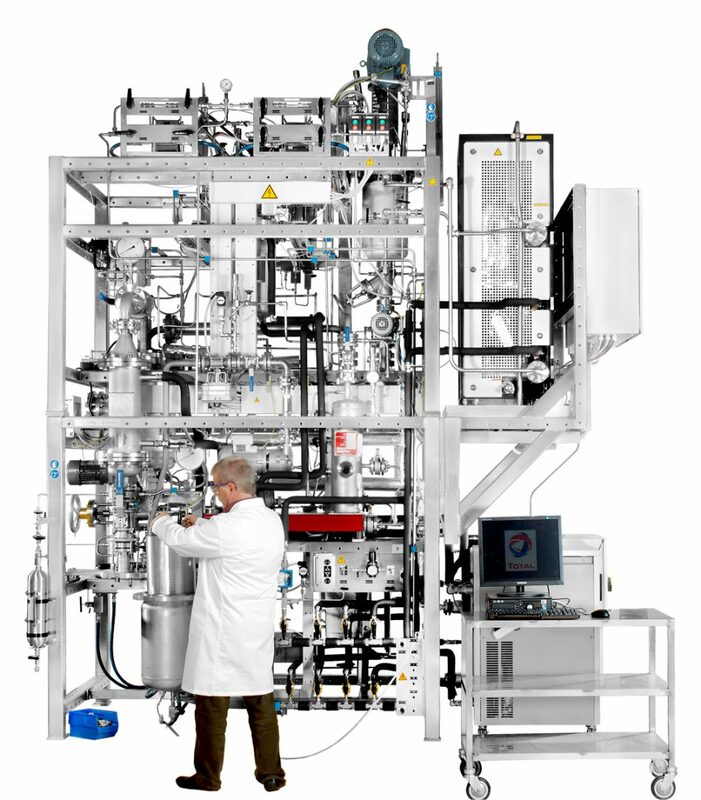 The unit was fitted with a powerful, dynamic Lauda thermostat system which made possible execution of polymerization reactions within the tight temperature specs, which were demanded by our client. Removal of viscous polymer melt without blockage required double-jacketed heated tubing and flanges. High-temperature gear-pumps were implemented in a dead-volume-free configuration on the bottom of the reactors to allow for polymer melt to be removed at the end of reaction and continuously fed to a high-temperature vacuum devolatizer where unconverted monomer could be removed to extremely low levels. The entire unit fit in a very small space as the client only had a small, exiting test cell for the unit. The process-control hardware and software was designed 100% in accordance with the clients site standards (Siemens/iFix). Numerous bugs had to be overcome after delivery as ILS did not yet have chemical validation testing capability at that time. We are proud of the fact, however, that ILS was able to successfully complete the site acceptance for this extremely challenging project. We have since continued to do business with this valued ILS client. One of the most common heterogeneous catalyst synthesis techniques is co-precipitation of metals or metal-precursors. This unit was specifically designed to assist a major catalyst supplier in testing the feasibility of scaling up their catalyst preparation from mg to the 500-700g level. The unit was designed to be completely corrosion resistent as many of the metal precursors are corrosive salt acid solutions. The reactor contains a pH probe, which was fully integrated into the process-control system, to allow for constant pH-controlled precipitation. 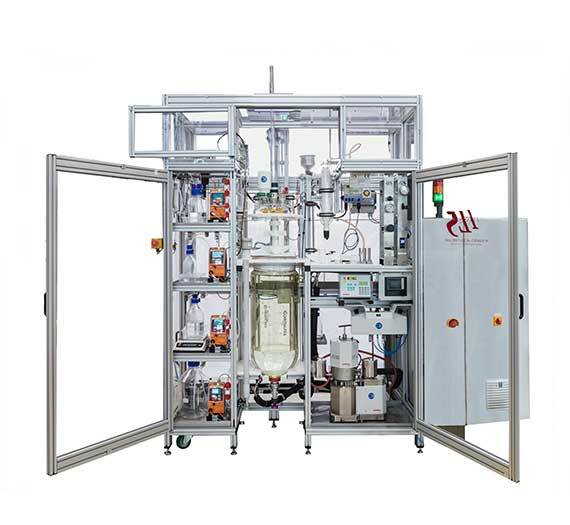 In such a case, the base addition is fully-automated and designed to make it possible for the user to target a specific pH at which the precipitation is to take place. A powerful thermostat provides sufficient heating and cooling capacity so that the reactor can be heated to the desired reaction temperatures in a reasonable amount of time, whilst still being able to prevent temperature overshoots resulting from the fast, exothermic precipitation reaction. The removal of SO2 from static emmissions sources like power-plants or chemical prodcution facilities is extremely important. 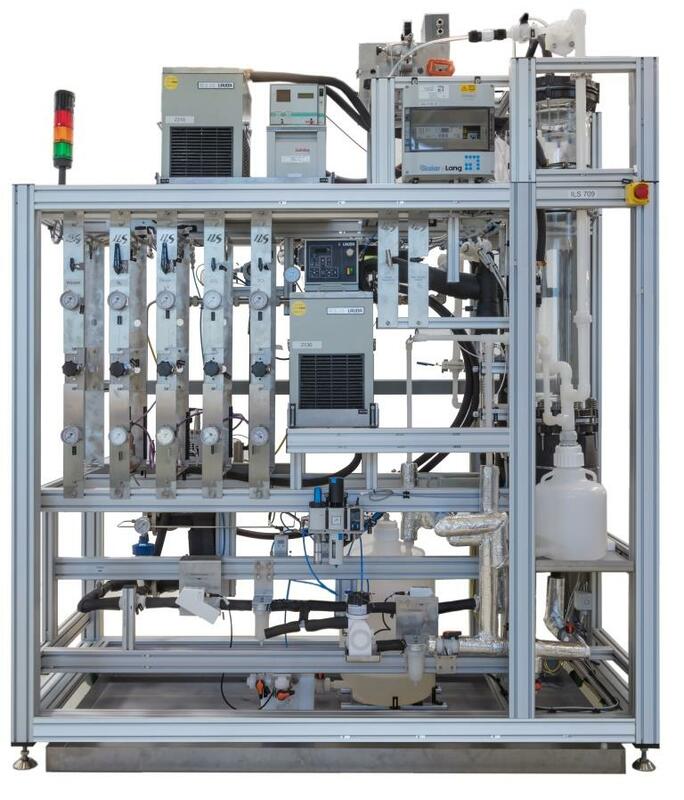 For this project, ILS was approached by a client to design and deliver a pilot-scale unit capable of testing various adsorption materials in trickle-flow modes. ILS constructed a large, double-jacketed trickle-flow column in close collaboration with the client. Great care was taken to prevent channelling or wall effects. The reagents are highly corrosive acids, which meant that the unit had to be constructed entirely of glass and/or corrosion-resistant polymer materials.